Your overhead door works hard to quickly and effectively operate, delivering convenience and safety for everyone. As one of the largest parts of your Florida home, the overhead door can be surprisingly heavy. Bear mind that the garage door parts in your roll-up system are built to last, but not indefinitely. Eventual repairs will be needed to ensure the best operations and safest conditions for your loved ones. For years, Guaranteed Garage Repair has served as your trusted team of experts across the state. 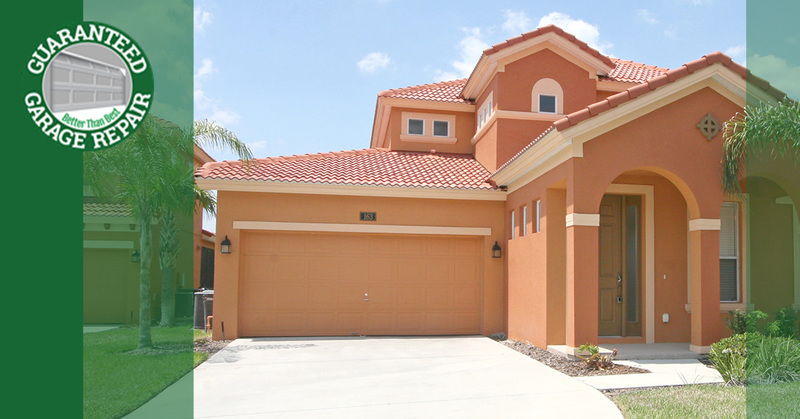 We proudly provide garage door repairs to Stuart, Sebastian, Jupiter, Port St. Lucie, and beyond. Our team is here to provide services that are “Better Than Best,” giving you the ultimate peace of mind with any and all of our garage door services. Today, we’ll highlight just how important your garage door springs are, as well as the risks of replacing them yourself. If you’re looking for quality garage door repairs across Florida, be sure to contact us now! Garage door springs, for example, are often rated to perform for 10,000, 15,000, or 20,000 uses. 10,000 uses before garage door spring replacement may sound great, but remember that most families use their overhead doors several times a day. After only a few short years, you may find it difficult one morning to open the door smoothly. Anytime the springs are in trouble, residential garage door repairs are recommended for the best and most expedient results. Extension springs, which are lightweight and stretch above the door system and guiding tracks. This cost-effective product is common across most homes, featuring a counterbalancing effect to support easier operations. Applied force causes the springs to extend, absorbing the energy of the door for future use. Torsion springs, which rely on torque to deliver support as opposed to extension. Installed directly above the opening, these springs expand and contract as force is added or subtracted, storing energy in the tightly wound coils. By twisting the rod and relying on the spring in conjunction with your pulleys, you are helping to ensure safe, smooth operations. Keep in mind that the type of garage door spring you use will affect operations and as well as safety measures. Extension springs, for example, must come with a safety cable to prevent dangerous outcomes in the event of a spring or bracket failure. Springs have the potential to fail at anytime, whether they are in use, open, or closed, so be sure to check your system. As always, our garage door maintenance pros are here and happy to help! Oftentimes, your system will begin to display symptoms before garage door spring replacements are necessary. While these signs may not occur suddenly, it is important to seek out garage door maintenance to ensure your minor problems do not evolve into more costly ones! Guaranteed Garage Repair is here to deliver the best results for your home, creating a personalized plan that provides unbeatable coverage to match our guaranteed services. If you notice any of the following symptoms while using your roll-up door, we recommend contacting us today for an appointment! Aching sounds – In addition to your springs beginning to creak and stretch out, you may notice other sounds sourcing from the brackets, pulleys, or cables during use. Opening your garage door can generate considerable noise, but any decibels over the normal should be addressed! Slower operations – Aging overhead door systems can begin to wear down and sag, slowing the speed at which your door opens. If you notice a serious slowdown, it may be time for service. Strained garage door openers – One problem many homeowners cite before calling is the straining sound produced by their openers. Remember that springs support a majority of the door’s weight, so any garage door springs in need of replacement will likely not support enough weight for your opening operations. Compromised springs – Any springs that look to be damaged or otherwise unusable should be replaced immediately. The potential for stored energy in these components makes them very dangerous in the event of a failure, damaging property and inhabitants alike. There are many things to know about garage door repairs, including the importance of spring replacements when necessary. Contact us today to schedule your garage door repairs in Stuart or the surrounding areas, and be sure to ask about our quality guarantee!